A student leader on MGA's Cochran Campus, Christopher Price is completing a business degree and working toward a corporate career. Age: 22. Hometown & Residence: Covington. High School: Eastside High School, where he participated in show choir and played football. Family: Carlita Hicks (mom), U.C. Price (grandfather), Alice Price (grandmother), Cameron Price (younger brother), Tony Hicks (stepdad), Shea Mitchell (aunt), and Imani Price (cousin). Degree Objective: Bachelor of Science in Business Administration with a concentration in Marketing. 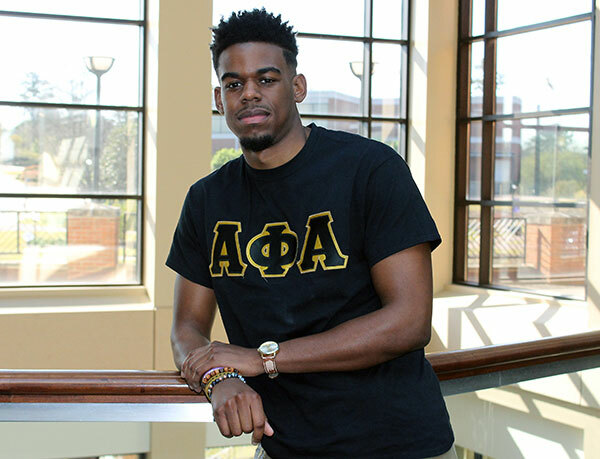 Activities: Alpha Phi Alpha Fraternity Inc. (chaplain and corresponding secretary), Baptist Collegiate Ministries (executive council), Brothers of Leadership and Distinction, Brothers Respecting Opportunities and Success Mentorship Program (mentor), First Baptist Church Cochran youth Bible study leader (9th grade boys teacher), Peer Career Advisor, and Resident Assistant. Career Goals: "I want to first get a master’s and a doctorate in business. Once I have achieved that, I want to work as a marketing manager. I want to work my way up the corporate ladder and either become a CEO, a member of a Board of Directors, or any other high-ranking management position." He chose Middle Georgia State University because … "I wanted to play football here. A friend from a college I attended previously told me about the football club so I transferred. Although football didn't really work out for me, I found out about these great organizations MGA has, like Brothers of Leadership and Distinction and Baptist Collegiate Ministries. These organizations helped me get out of my comfort zone and help make me into the man I am today." The greatest thing he discovered about Middle Georgia State was … "The chance it gave me to discover my leadership abilities. I found my voice and learned that I can help bring change in people’s lives. This was something that I didn’t believe I even had in myself. This newfound ability built up my self-confidence. It made me realized that I can move mountains as long as I have faith in myself." His greatest academic experience s a Middle Georgia State student has been … "Staying focused during the fall semester of my senior year, the most challenging academic time for me. I was taking six classes at the time and was heavily involved in my organizations. I was also joining a new organization, Alpha Phi Alpha Fraternity Inc., which took up most of my time. But I was able to stay focused. My friends and family helped motivate me when I was down because it was extremely difficult. I was able to finish the fall semester with a 3.4 GPA. I was very proud of myself because I thought that I couldn’t do it. That semester encouraged me to believe in myself and to never give up. No matter how bad the situation may look, I still determine my fate. That semester was a breakthrough for me." To him, “greatness” means … "To be able to keep pushing forward when conflicts and tribulations present themselves. Greatness exists in all of us yet most of us shy away from it. This gives greatness such significance. Greatness brings out the best in individuals at their most difficult times. Greatness is more than just a word to me. It’s an ideal." In five years … "I see myself working on my doctorate and making lifelong connections. I also see myself paying off student loans so that I can be debt free. I plan on getting a job that would help jumpstart my career in the corporate world. I want to use the lessons I’ve learned over the years to educate others and continue to serve others. I believe that I can and will achieve everything that I have worked and prayed for."